There are a lot of questions around taking action when it comes to the Law of Attraction. Do you have to take action after you ask for what you want? Can you just ask and forget about it, never taking any action at all? 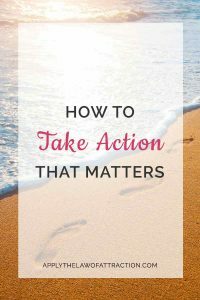 Does the Law of Attraction Require Taking Action? YES!!!! You need to take action and move towards your desire. Action shows the Universe that you are serious about your intention. This sets a tremendous amount of energy into motion that will allow your desire to manifest in your life. Get clear on what you specifically want to create, then do something about it. After You Get Clear on What you Want to Manifest, What Kind of Action Should You Take? You want to take action that moves you towards your desire, but you want to remain unattached to the outcome. No matter what you're doing in life, whether you're consciously applying the Law of Attraction or not, there's no halfway step in taking action towards your goals. You're either doing it or you're not. If there's something that you really want, you're going to go after it. You're not just going to sit on your couch waiting for the doorbell to ring. If you want to see results, you don't just sit there and wait for them. You do something about it! You get up and take action towards your goals. I'll admit there are times when a goal seems so big that it's hard to know where to start…or when life has become so overwhelming that you just want to sit on the couch because it's easier than trying to figure out what to do. But when those times happen, the best thing you can do is to not overthink things. Just make a quick decision of what to do – and then do it! Your intuition will be at its peak if you don't overanalyze. Once you start tackling something, it becomes more manageable and it's easier to know what the next action is to take. Let these affirmations help you take action that really matters. Pick your favorites or use them as inspiration for creating your own affirmations. I intend to take joyful action towards my dreams. I easily make the right decisions about what action I need to take. I eagerly take steps towards the glorious life I deserve. I allow divine guidance and inspiration to flow through me as I move closer to my goals with each passing day. I see myself in utter alignment with the right actions that will propel me towards manifesting my desires. I take action from a place of stillness and serenity. I intend that I know what actions will manifest my desires with magical ease and perfect joy. Every action I take leads me towards magnificent success. I love how easily I know what steps to take to manifest my dreams, and how effortlessly I take them. Every day, I see results from actions I have taken, allowing me to receive everything I desire even greater than I imagined. I intend to let go of all control and allow the Universe to guide me in what actions I need to take. I love how open I am to taking action towards manifesting my intentions. I am filled with exuberance and joy as I move in the direction of my desires. Passion flows through me as I eagerly create my desired reality with utter ease. I see myself as centered and grounded as I take brilliant action towards creating my goals with ease. I am open to divine inspiration to show me which actions I should take to manifest my intentions. I am a vibrational match to inspired actions that allow me to draw my desires to me. Today, I am taking action towards making my vision a reality. What action can you take today that will move you towards manifesting your intentions? Read all the steps on how to create your most incredible year!